Data is from the July 2018 Vibes "2018 US Mobile Consumer Report" conducted by Cite Research. 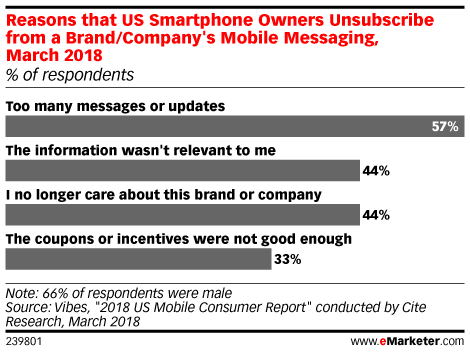 1,000 US smartphone owners ages 18+ were surveyed online during March 2018. 66% of respondents were male and 33% were female. 27% of respondents were ages 18-34, 21% ages 35-44, 16% ages 45-54 and 18% ages 55+. Vibes is a mobile solutions provider.